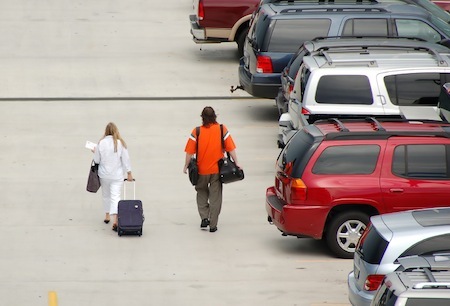 We take a look at some of the common questions posed by motorists planning to leave their car at the airport. What if my car doesn’t start / the battery is flat when I return? I am leaving my car at the airport soon and don’t want to spend my holiday worrying that it won’t start when I get back. What can I do to make sure this won’t happen? The biggest enemy of airport parkers is battery failure. The RAC says that batteries are most likely to go flat when the car has been left parked for a long period of time and that this is a particular risk in cold weather. Batteries need to be replaced on average every three to five years, so if yours is on its last legs, perhaps replacing it before you set off for the airport is a good idea. My battery isn’t that old so I don’t want to replace it. Is there anything I can do to check that it is still in good condition? You can have your battery professionally checked but if you want to cut costs there are a few things to look out for yourself. – Check that there are no white or rust-coloured deposits on the terminals or connectors as this indicates corrosion. – Make sure there are no bulges in the casing. – Finally, a good give-away of battery troubles is when the interior lights are dim or will not come on at all. Is there anything else that I should do to my battery to make sure it is in tip-top condition? If your battery is not a sealed unit, you should check the electrolyte level and top up with distilled water. Also make sure that when you leave your car you switch off all lights, heated seats, etc, to avoid the battery draining in your absence. Is it worth investing in a pair of jump leads? This could be a handy thing to have in the boot, but make sure that you know how to use them. Read through the instructions several times before you leave for your holiday. Standing in a cold, dark car park is not the best time to try and figure out what to do. Better still is the “smart charger”, which will keep your battery topped up when required. Will the cold cause any damage to my car when it’s left for a while? What about my tyres? Is there anything I need to do? Check your tyre pressures before setting off for the airport to avoid coming back to find them dangerously under-inflated. Do not be tempted to reduce the pressure to get more grip in snowy conditions. According to the AA, it has no effect and reduces stability, making for a dangerous driving experience. When I left my car at the airport last Christmas I returned to find it like an igloo and had to call the AA out to get into it. Is there anything I can do to be more prepared this year? This is something all winter travellers should think about. You may have left the UK in benign conditions, but the weather in the UK can change quickly as we all know! Before you go, put a little silicone-based furniture polish on to a cloth and apply to the rubber door seals. This will stop them freezing. If you find that your locks are frozen, try warming your key with a cigarette lighter or one of the handy key-ring gadgets that are cheap to buy. Don’t breathe on the lock as the moisture in your breath will condense and freeze. Make sure your anti-freeze is kept at the correct level and avoid mixing different types. – Ensure your windscreen wipers are left in the off position to avoid them freezing to the windscreen in your absence. – Keep your windscreen washer topped up and use a suitable additive to avoid it freezing in winter. – If you come back to snow, make sure you clear it thoroughly from your car before driving off. – Don’t forget to pack an ice scraper and some de-icer spray. – Finally, have details of your car breakdown membership so that if the worst comes to the worst you won’t be stranded!